Seeing a need for insignia to replace those that may be less than outstanding that are supplied in kits, Eagle Strike has come up with two more sheets. 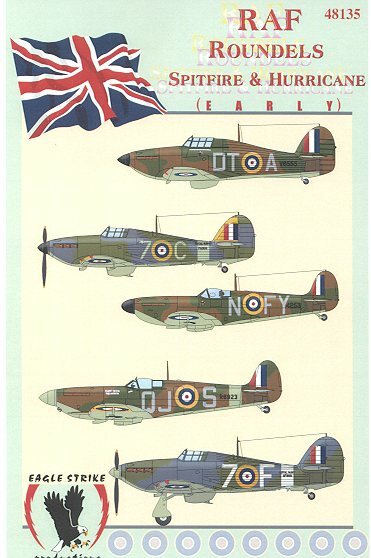 This first one is for the Spitfire and Hurricane and consists of two and a bit sheets. This should be more than enough to last for quite a while and will come in quite handy if one wants to build all the markings on a sheet for which not enough insignia are provided. This one concentrates on Hurricanes and Spitfires. It also includes the Munich Crisis roundels and a number of greenish 'gas' patches. Fin stripes in different widths are also included on the sheets. You'll notice that the red center dots are provided separately on many of the roundels so that registration isn't a major problem. I've always thought of it as allowing the builder to mess it up instead of the decal maker! 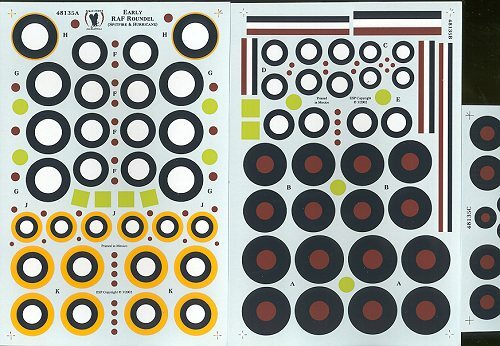 On the back of the cover sheet is a listing of which size roundels were used on which aircraft.